In 2019, the Eiffel Tower celebrates its 130th anniversary! With nearly 7 million visitors in 2018, the Eiffel Tower is the symbol of France and one of the world’s most popular attractions. The Eiffel Tower was designed and built on the occasion of the World Fair held in Paris in 1889. The construction of the Eiffel Tower was finished on 31st March 1889, 130 years ago! Since its inauguration, 250 million people have visited the Eiffel Tower and still counting. But not many people know what is the Eiffel Tower or why was the Eiffel Tower built, the history behind it, and actually it is a very interesting history! Planning a trip to Paris in 2019? Add an extra focus and meaning to this special trip and join some of the Eiffel Tower events #eiffel130 around this special Eiffel Tower anniversary. On this post, we tell you about all the celebration activities around the Eiffel Tower, Eiffel Tower tickets as well as our best tips to get the most out of your visit! The Eiffel Tower was built between 1887 and 1889 as the entrance arch to the Paris World Fair in 1889. The Eiffel Tower was inaugurated on 31st March 1889. However, it was not yet 100% finished and visitors had to walk up to the second platform. First named Tour de 300 mètres (300 m tower) because of its heigh, later It was named after Gustave Eiffel, who built the Eiffel Tower. Initially, the Eiffel Tower was 312 m high and for 41 years the world’s tallest man-made structure until the completion of the Chrysler Building in New York in 1930. Today the tower is 324 hight, due to additional antennas. There are 1,665 steps from the ground floor to the top. However, during the cold weather, the tower shrinks by about 15 cm. The total weight is 10.100 tons. The Eiffel Tower was used in the past for many scientific experiments. It is now used as a transmitter of radio and television programs. Place du Trocadéro is a very popular place (and perhaps the best place) to get great photo shots with the Eiffel Tower in the background. Trocadéro is always full of tourists looking for the perfect shot but it is especially busy for viewing the Eiffel Tower at night, all lit up and glistening with thousands of lights. Visitors can reach Place du Trocadéro by metro, Trocadéro metro station, lines 6 and 9. OUR TIP: if it is raining in Paris, enter Palais Chaillot, the building just on the left of Place du Trocadéro. There is a nice cafeteria with awesome views of the Eiffel Tower without the rain! OUR TIP: boat tours usually run until 10.30 pm so to see the monuments illuminated we recommend booking the last or pre-last boat tour. When the weather in Paris is nice there are few better ways to enjoy Paris than from above, cocktail in hand, admiring great panoramic Paris views with the Eiffel Tower and other famous landmarks that define the city. There are many trendy rooftop bars in Paris, you just need to have a look at our post and choose one! 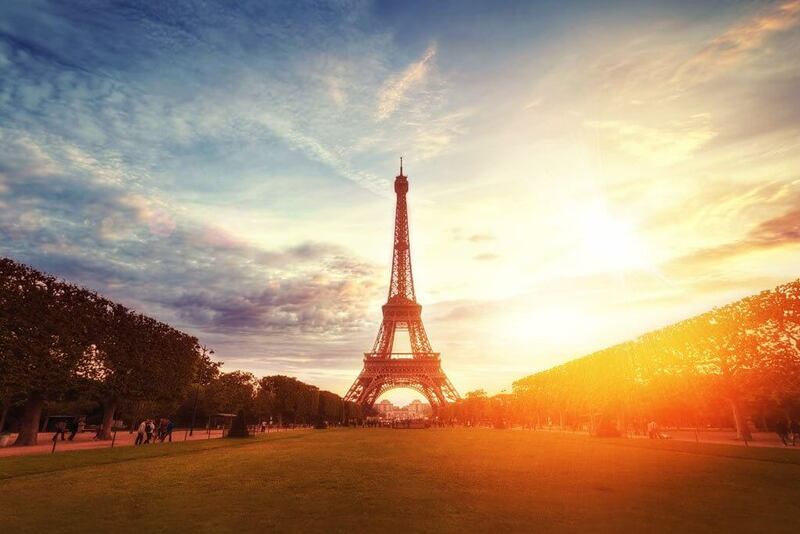 We suggest arriving in late afternoon for a spectacular view of the city and the Eiffel Tower in the setting sun. You don’t need to climb up the Eiffel Tower to realize how impressive it is! The view of the tower standing directly underneath it is a unique experience and we are sure that this particular point of view will not let you indifferent. Hold on! We tell you all that you need to know to climb the Eiffel Tower in the chapters below. » Where is the Eiffel Tower? The Eiffel Tower is located in the Left Bank of the Seine River, at the north-west side of Champ de Mars in the 7th Arrondissement of Paris. The Eiffel Tower address is 5 avenue Anatole-France, Paris. » The monument is very easy to reach by public transportation: the Parisian metro stops at Bir el Hakeim (line 6) and École Militaire (line 8) while the RER C has stops at Champ de Mars -Tour Eiffel and Alma stations. When you visit the Eiffel Tower, you can decide to visit it all or only up to the Second Floor. The Second Floor can be reached by stairs or lift while the Submit can be reached by lift only. » During the high season, it seems there is no best time to visit Eiffel Tower and Eiffel Tower waiting time can be up to 2 hours within the time slots marked as “very strong”. 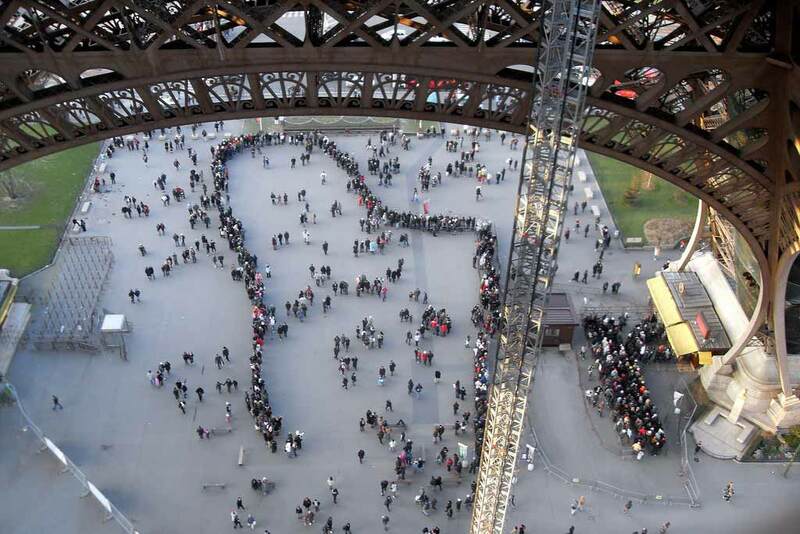 »During the low season, Eiffel Tower lines are shorter, especially during the weekdays. The best time to visit Eiffel Tower during the low season is early in the morning and late in the afternoon. As mentioned above, the Eiffel Tower visit is pretty flexible, with 4 different options to choose. Eiffel Tower sells standard tickets (no skip the line tickets) to the Second Floor and to the Second Floor + Summit, both tickets with a stop on the First Floor. All the tickets include the access (by lift or stairs) back to the ground floor. The Second Floor can be reached by stairs or by lift. Once you are on the second floor, the Eiffel Tower Summit can be reached by lift only. This means that there are 4 different standard Eiffel Tower tickets, but only two are available online. » Standard Paris Eiffel Tower Tickets to the Second Floor by Stairs: on sale at the tower only. » Standard Paris Eiffel Tower Tickets to the Second Floor by Lift: you can buy these Eiffel Tower tickets online. » Standard Paris Eiffel Tower Summit Tickets by Stairs + Lift: on sale at the tower only. » Standard Paris Eiffel Tower Summit Tickets by Lift + Lift: you can buy these Eiffel Tower tickets online. If you decide to buy these standard Eiffel Tower tickets online, you will pick a date and also a time slot. Time slots are every hour which means that you will be waiting in line one hour maximum. 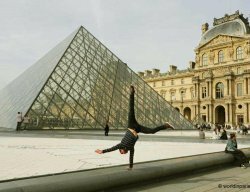 WE RECOMMEND: Skip the Line Eiffel Tower tickets are one of the best investments when you are visiting Paris. With Skip the Line Eiffel Tower tickets, within minutes you will be inside the elevators and on your way to discover the second floor of the Eiffel Tower. This is too cool and saves you lots of time. Only tour operators like Viator or Get Your Guide sell this kind of tickets alone or in combination with other Paris sights. Disclaimer: the events described below are just guessings by our team while waiting for the official communication on the events. We will update the post with the official program as soon as the Eiffel Tower team will publish the list of the events. 13th March 2019 event confirmed! Head to the Tower to watch the 5th edition of the vertical race La Verticale de la Tour Eiffel. This year, 130 runners (like the tower’s age) will climb the 1665 stairs of the Eiffel Tower up to the top, where they will be rewarded with awesome views. 30th March 2019 event confirmed! 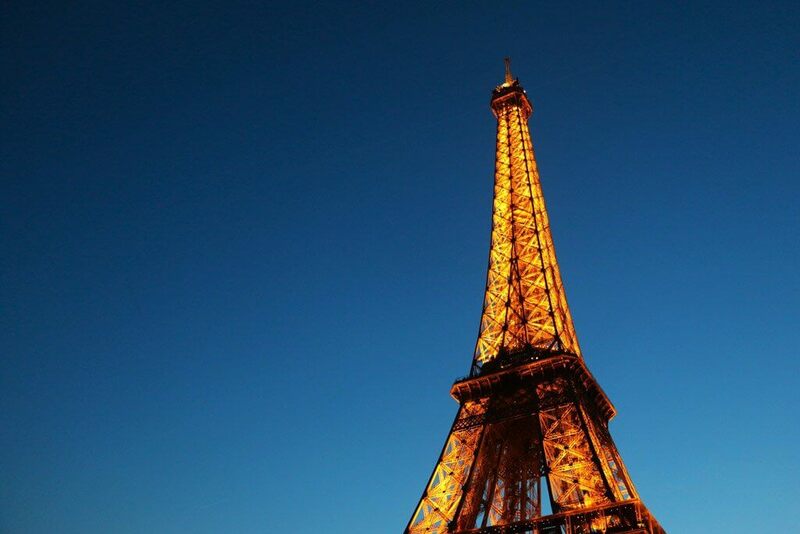 On March 30th, the Eiffel Tower and many other French monuments go dark to celebrate nature and #EarthHour! Switch off your lights for one hour, from 8.30 pm to 9.30 pm and help us to save the Planet. 30th – 31st March 2019 events confirmed! During the weekend of the Eiffel Tower’s birthday (30th and 31st March) La Dame de Fer proposes its visitors a (FREE) Adventure Game. This game is part treasure hunt and part immersive theater, with actors dressed in costumes to help. The challenge? Find the confidential file which will unlock the most hidden secret of Eiffel’s workshops. The Eiffel Tower will also host on the esplanade a new photo exhibition with the portraits of the women and men working for the Eiffel Tower. Finally, don’t miss the evening events to celebrate the Tower’s 130th anniversary, with music and much more. 31st March 2019 – 31st December 2019 event confirmed! From 31st March 2019 and until the end of the year, people visiting the Eiffel Tower can join its (FREE) Adventure Game. Find the confidential file which will unlock the most hidden secret of Eiffel’s workshops while learning interesting facts and anecdotes about the Eiffel Tower. We have done this Escape Game and it was really cool! 14th of July is France’s National Day so we expect to see a big event to honor the symbol of Paris and France turning 130 years. Paris usually celebrates the 14th of July with a special Eiffel Tower illuminations and fireworks show. Can this year be even more special? We say YES! For the Nuit Blanche in 2018, the Eiffel Tower proposed a very special performance with lights and music. It was a performance of deconstruction and construction, making the Tower’s lights “fall” in the reverse sense from the tower was built to restore them again floor by floor. We hope that for the next Nuit Blanche (5th October 2019) in such a special year, the Eiffel Tower will surprise us again. Contrary to popular belief, the Eiffel Tower does NOT hold firework shows for New Year’s in Paris. The last time there were fireworks for New Year’s dates back to the special exception that was allowed for 2000 millennium celebrations. Is the Iron Lady going to make an exception for her anniversary? Surprise, surprise! Thanks to its monumental size, the Eiffel Tower can be seen from almost every corner of the city, usually outstanding amongst the quintessential rooftops of Paris. However, not many Parisians can boast of having an apartment with an Eiffel Tower view, this is a rare privilege just for a few of us. 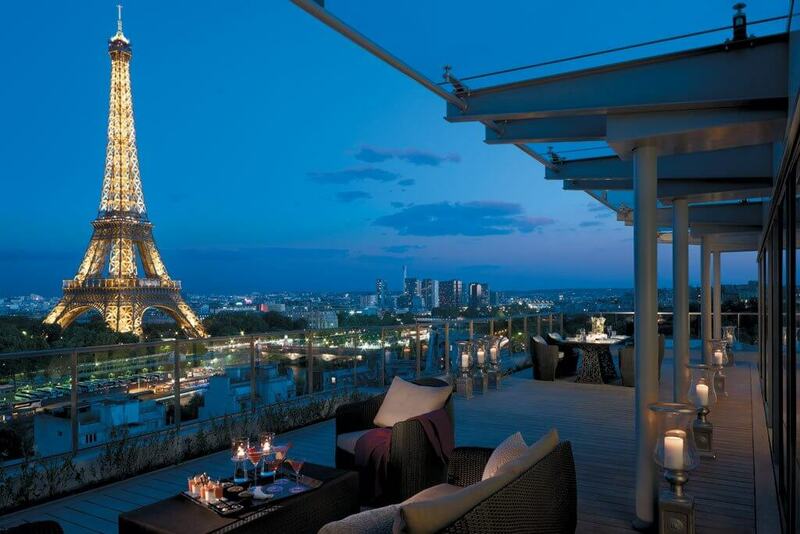 The good news is that some of Paris’ top luxury hotels, well known for their great facilities and amazing interiors, come also with the best views of Eiffel Tower, especially beautiful during its night show. So if you are traveling to Paris for a few days and you can afford it, why not treating yourself with the pleasure of waking up with an amazing Eiffel Tower balcony view? The 7th arrondissement of Paris is delimited by the Seine in the North, Rue des Saints Pères and Rue de Sèvres in the East and Avenue de Suffren in the West. The Eiffel Tower arrondissement hosted during the XIX century five Universal Exhibitions and some of its main sights, as well as the district’s general layout, is the result of these special occasions. 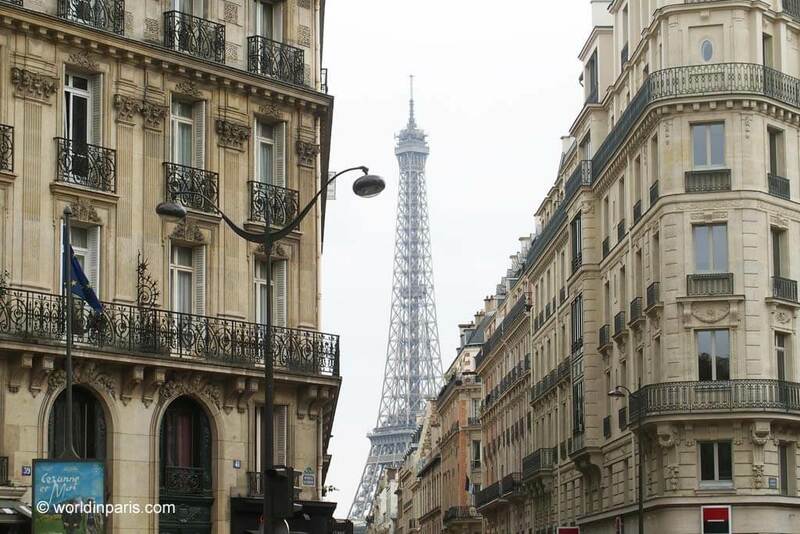 This is the Eiffel Tower district but of course, there is much more to explore.